Horse racing betting interfaces are designed to display a lot of information in a limited space. The betting area at any racetrack or online racebook may look like a jumbled mess of numbers, but it’s not bad at all once you get a little familiarity with what’s going on. Understanding how the payout odds work will take you a long ways in making sense of everything. Learning how to read the odds in racing betting isn’t as difficult as it may seem. A little familiarity with fractions helps but you do not need to be a mathematician by any stretch. All it takes is a little practice and eventually it becomes second nature to look at a list of wagers and understand what it all means. Each horse expected to compete in an upcoming race is listed on the tote board along with his payout odds. The purpose of these odds is to tell you how much money you can expect to win if you pick that horse and he finishes high enough for your bet to win. 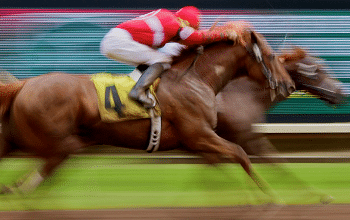 Racing odds are displayed as fractions, so all you have to do is multiply your intended wager by the fraction. The number you get represents the net profit you will see if your bet is a winner. The fractional odds system is easy to use when looking at longshots where the odds are whole numbers like 5/1, 10/1, 30/1 and so on. For example, a $2 bet at odds of 30/1 would return $60 in profits ($2 x 30/1). Add in the return of your original stake and the total return would be $62. Likewise, a $2 bet placed at 10/1 would return $20 plus your original wager. It gets slightly more complicated when the odds aren’t nice simple whole numbers. For example, odds of 3/4 and 11/9 can be a little tricky. If you don’t have a calculator handy, the next easiest way to figure out what you stand to win is to divide your intended wager by the denominator (the second number in the fraction) and then multiply that by the numerator (the first number in the fraction). Let’s take a look at how you would calculate a $10 bet at 4/5 odds. Your total profit would therefore be $8. Add back your original wager for a total return of $18. Another way to look at the odds is that they show you how much money you stand to win and how much you have to risk to win that much. For example, take odds of 7/2. This means that you stand to win $7 for every $2 you wager. Therefore, a wager of $2 would net you $7 in profits for a total return of $9. In some parts of the world, horse racing wagers are displayed in the decimal odds format. Don’t worry if you visit a website or racebook somewhere and see a bunch of decimal odds posted all over the place. These are even easier to read than fractional odds. The decimal format displays exactly how much money you stand to win in relation to your wager. All you have to do is multiple your intended stake by the decimal and the result will tell you the total payout including the return of your original wager. Even money odds in the decimal format are displayed as 2.0. In this case, a successful $100 wager would return $200 (your winnings plus your original bet). Likewise, odds of 3.0 would return $300. If the odds are less than 2.0, it means you’re looking at a big favorite. For example, betting odds of 1.5 would return $150 ($50 in net profit plus your original wager). The one thing you have to be careful about with decimal odds is making sure you don’t forget that the calculated payout includes the return of your original wager. If you’re accustomed to the fractional format, it’s easy to forget. Fractional and decimal odds do not perfectly translate. What I mean is that fractional odds of 5/1 are NOT the same as decimal odds of 5.0. Odds of 5/1 would result in you being paid $500 in net profits (total return including your original wager would be $600). Odds of 5.0 would result in you being paid $500 in total (this includes your original wager).